When I first started riding a road bike, nearly eight years ago, I thought you just jumped on and away you went, but it didn’t take me long to realise that there was more skills involved than I had first thought, and for me one of the hardest to master has been descending on a road bike. And there’s definitely still room for improvement. So when putting these descending tips together I’m paying lots of attention, because everyone can do with a refresher every now and then. To start, familiarise yourself with the condition of the road surface by riding up the hill. Look for loose gravel on the shoulders, potholes or cracks on the road surface. Look also at the radius of the turns – do they follow a continuous arc, or do they become sharper during the middle of the turn? Are there sections that suddenly become steeper? I find it much easier to descend on roads that I’ve ridden many times before, because you become familiar with them. Although I never become complacent, because a pothole could have opened up since last time I rode it. With your hands on the lower part of the handlebar, your centre of gravity is closer to the ground which makes you more stable. Also, your weight will be more evenly distributed between the front and rear wheels, which helps maintain traction, especially during braking and turning. It also means that you can hold your brake levers more comfortably which makes a big difference on a long descent. Keep your head up rather than focusing on the road just in front of your bike. Look for danger signs so you have time to react. In turns, keep your eyes on the exit, which will help you carve a smooth, steady line all the way through. The old adage that you’ll end up where you look is so true when descending on a bike, so don’t look at the guardrail or the large tree as you round a corner, because that’s where you’ll end up heading. Start at the top of your body and let go of tension. Keep breathing, open your mouth to unclench your jaw, drop your shoulders, bend your elbows, release your death grip on the bar, uncurl your toes so your feet lie flat on the bottoms of your shoes. I’m particularly bad at this one and quite regularly remind myself to let go of the tension particularly in my shoulders and upper back. Always anticipate what you’ll need to do next. This will help you avoid sudden braking. For controlled slowing, gently squeeze both levers equally with two to three second pulses. This is called feathering. Constantly riding the brakes on big descents can make rims overheat and possibly cause a blowout. This is particularly true with carbon rims which overheat more quickly. When I bought new wheels last year I chose carbon wheels with an alloy braking surface because they don’t overheat as easily as a carbon braking surface. 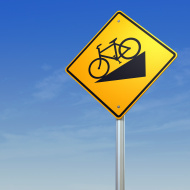 The biggest mistake people make descending is to wait until they’re in the middle of a turn to brake. Instead, scrub speed before the turn. If you have to brake in the turn, you didn’t slow enough to begin with. Then, push your outside pedal down with pressure on that foot. To initiate the turn, lean the bike, not your body into the turn. The faster and sharper the turn, the more you’ll lean the bike. To exit the turn, gently straighten the bike. Like all bike skills you need to practice it over and over again to learn it properly. Choose a small descent to begin, and repeat it over and over until you feel comfortable. Share you tips for descending on a road bike in the comments or the Women Who Cycle Facebook page. Previous Post:What’s it like to work for a pro cycling team? Next Post:Female cyclists – Why not give bib shorts a go?